KINSHASA, DEM. REP. Of CONGO (AFP) - Even the fate of Blaise Compaore, who was ousted after a bloody uprising in 2014 after 27 years as president of Burkina Faso, has not been enough to deter other African leaders from clinging to power long after their constitutions demanded they go. In 2015, two African presidents amended their constitutions to allow them to seek another term — or more. 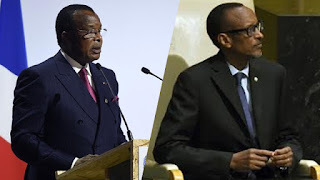 Denis Sassou Nguesso, who has now led Congo-Brazzaville for more than 31 years, and Paul Kagame, Rwanda's head of state since 1994, both ordered referendums which will allow them to run again in 2016 and 2017 respectively. In neighboring Democratic Republic of Congo, Joseph Kabila is due to stand down in 2016 after 15 years at the helm, but fears are mounting he too could stay on as the country endures a period of uncertainty. The president has shown no sign of preparing to leave office and is now calling for a "national dialogue" to allow for a peaceful vote. Opponents view the demands as a trap, which could allow his supporters to put off polls for two to four years until they can organize "credible" elections. Meanwhile, to the east of the DR Congo, Burundi has been in crisis since April, when president Pierre Nkurunziza sought a third term in a move that even some in his own camp judged unconstitutional. The situation deteriorated when Nkurunziza was re-elected in July, on a ballot that was boycotted by the opposition. The country has since spiralled into violence and there are fears in the international community this could break out into genocide. "The limit of two presidential terms in African constitutions goes back to the late 1990s," said Thierry Vircoulon, associate researcher at the French Institute of International Relations (IFRI). "It was a lesson drawn from (the results of) autocratic regimes and presidency for life," he told AFP.